Description: New York Times, #1 international bestselling author, and world-class forensic anthropologist Kathy Reichs takes Temperance Brennan behind the scenes of a major commercial airliner crash in this magnificent follow-up to the New York Times bestselling Deadly Decisions. Temperance Brennan hears the news on her car radio. An Air TransSouth flight has gone down in the mountains of western North Carolina, taking with it eighty-eight passengers and crew. As a forensic anthropologist and a member of the regional DMORT team, Tempe rushes to the scene to assist in body recovery and identification. Tempe has seen death many times, working with the medical examiners in North Carolina and Montreal, but never has tragedy struck with such devastation. She finds a field of carnage: torsos in trees, limbs strewn amongst bursting suitcases and smoldering debris. Many of the dead are members of a university soccer team. Is Tempe’s daughter, Katy, among them? Frantic with worry, Tempe joins colleagues from the FBI, the NTSB, and other agencies to search for explanations. Was the plane brought down by a bomb, an insurance plot, a political assassination, or simple mechanical failure? And what about the prisoner on the plane who was being extradited to Canada? Did someone want him silenced forever? Even more puzzling for Tempe is a disembodied foot found near the debris field. Tempe’s microscopic analysis suggests it could not have belonged to any passenger. Whose foot is it, and where is the rest of the body? And what about the disturbing evidence Tempe discovers in the soil outside a remote mountain enclave? What secrets lie hidden there, and why are certain people eager to stop Tempe’s investigation? Is she learning too much? Coming too close? With help from Montreal detective Andrew Ryan, who has his own sad reason for being at the crash, and from a very special dog named Boyd, Tempe calls upon deep reserves of courage and upon her forensic skill to uncover a shocking, multilayered tale of deceit and depravity. 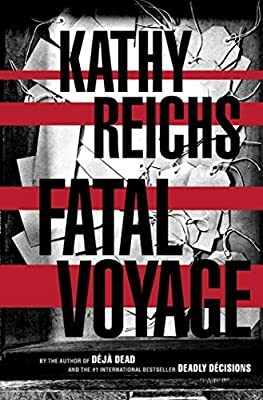 Written with the riveting authenticity that only world-class forensic anthropologist Kathy Reichs can provide, Fatal Voyage pairs witty, elegant prose with pulse-pounding storytelling in a gripping tour de force.